Ice dams at the edge of the roof can be quite destructive to your home. Removing them before they do damage is very important. But preventing them should be your first priority. Ice dams form when the snow above the eave melts along the surface of the shingles and runs down the roof. This happens when the attic temperature is above freezing. The water freezes at the bottom of the roof because the eave, which extends beyond the home’s exterior wall, is below freezing. Over time the ice builds up and forms a dam. 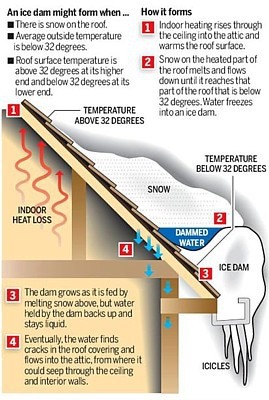 How an ice dam forms. 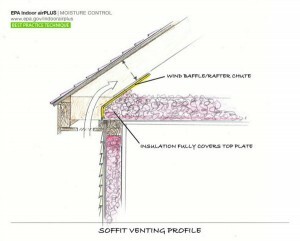 Diagram by Owens Corning®. The reason ice dams often form after a heavy snow is because the snow acts as an insulator, trapping whatever heat enters the attic. The situation is made worse when storms are followed by extremely cold weather with bright sunny skies. The solar melt starts the water flowing but the cold freezes it in place. A series of freeze-thaw cycles further complicates matters. The result is dams on the gutters and icicles everywhere. Ice damns can create a lot of havoc with your home because the melting water can backup above the eave and flow under the shingles and into your house. Your modular home will come with a water proof membrane under the shingles at the eaves, but when the conditions become extreme the dams reach higher up the roof than is covered by the membrane. The leaking water can damage insulation, drywall, paint, and framing. It can also fuel the growth of mold. There are two ways to handle an ice dam: manage it at the eave, where the freezing occurs, or deal with it in the attic where the melting starts. One way to take care of the eave is to install heat tape. Electricity running through the tape warms the eave enough to reduce ice accumulation. It helps if you install the tape before the first snow storm. Otherwise you will need to first remove the snow. 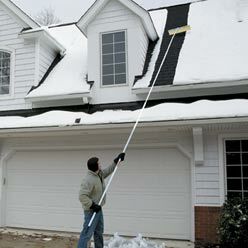 Use a snow rake with a long handle to safely remove snow from your roof. Another way to handle ice at the eave is to use a snow rake. It helps if you keep up with this throughout the winter. But don’t use a shovel, ice pick, hatchet, hammer, chisel, chainsaw, etc. 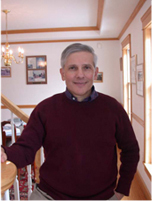 They will almost certainly damage your shingles. Moreover, they can endanger your health. Salt will melt the ice, but it will also damage your landscaping. 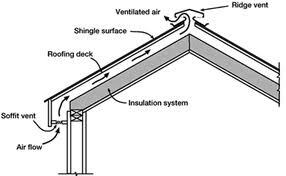 Attic ventilation is typically done by bringing in the cooler outside air through a soffit and venting out the warmer attic air through a ridge vent. A better way to deal with ice damns is to stop them before they start, which requires you to reduce the temperature in your attic so the snow doesn’t melt on top of the shingles. The most important step you can take to control the attic temperature is to ensure the attic air is circulated with the outside air. The ventilation is typically done by bringing in the cooler outside air through a soffit and venting the warmer attic air out through a ridge vent. The system will only work as designed if baffles are in place at the lower side of the roof. Otherwise the attic floor insulation will block the air flow from the soffit into the attic. The general contractor should verify that baffles are in place at the lower side of the roof so the attic floor insulation does not block the air flow from the soffit into the attic. Even if you have a good ventilation system, heat can build up if too much of it escapes into the attic from the home. This can happen when there is insufficient insulation in the attic floor or if the insulation is poorly installed. Air infiltration from the story below into the attic can be a significant source of unwanted attic heat. Inadequately insulated attic duct work is major culprit. So are uninsulated folding attic stairs and recessed can lights installed in the ceiling of the story below. The same holds for bathroom fans that vent improperly into the attic. With a modular home, most of problems that cause ice dams are the responsibility of the general contractor. 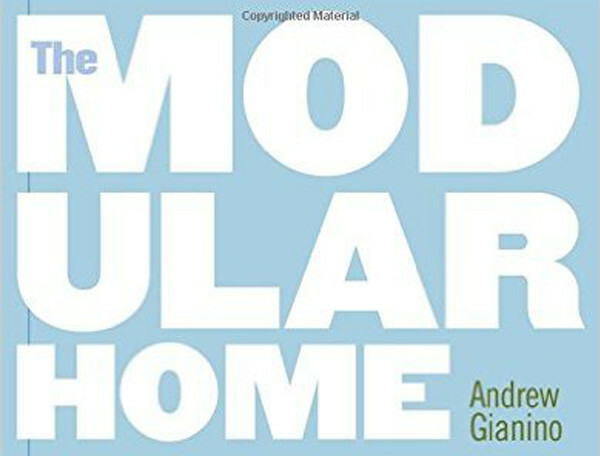 For example, here is information about sealing a modular home against air infiltration. If an ice dam forms on your home, ask your general contractor to help you determine the cause. But don’t wait to remove the dam. The damage could be more expensive to fix than remedying the cause.